Plasma cell. 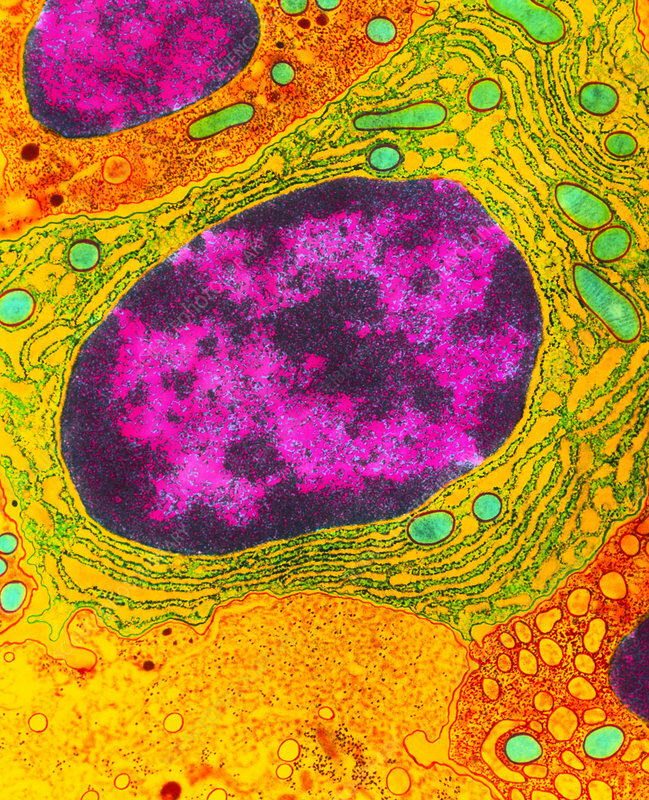 Colour transmission electron micrograph of the contents of a plasma cell from bone marrow. Plasma cells are mature B-lymphocyte white blood cells that secrete antibodies during an immune response. Characteristic of plasma cells is the arrangement of heterochromatin (dark crimson) in the nucleus, which adheres to the inner nuclear membrane. Also typical is the network of rough endoplasmic reticulum (green tubes) in the cytoplasm, where antibody synthesis occurs on ribosomes (dots). The oval or rounded green structures in the cytoplasm are energy-producing mitochondria. Magnification x8,200 at 6x7cm size. Magnification; x27,300 at 10x8" size.